Isaak wrote in Thu Apr 04, 2019 7:49 am: FlyingHigh, FlightGear is developed by volunteers who improve it on their own schedule for the features that they want to see themselves. The way you are ordering our core developers to invest their spare time in a feature that is working but has some wrong/missing words in your opinion really won't help your case. It won't happen. If you want to change something, do it yourself and propose your fix as a commit rather than stating that a feature is bad and should be removed without providing your fix. I - as both a user and a developer - need that menu to conveniently start/stop scenery downloads, so removing it is not an option for me. I don't see any reason why this single menu item would bother you so much. You aren't a consumer from a company that you've paid for. You are a user of free, open source software that fully enables you to modify the sim on your side in places you like but others don't. Case closed for me. I did not order anyone to do anything. Each of my requests is carefully pefixed with the word " Please", rendering each of my request into the realm of just that, a request. I'm very well aware that FG is an open source project maintained by volunteers, among them , me (and you! And others!). I think you do protest too much. Point taken Thorsten, and thank you for it. And your "Dito" should be "Ditto" . FlyingHigh wrote in Thu Apr 04, 2019 5:23 am: 1. download "traffic"
3. download/update " other files" . Legoboy thank you very much for offering a possible solution to the problem. The top level menu choice, as it exists now, before your suggested change, states "Download Scenery". 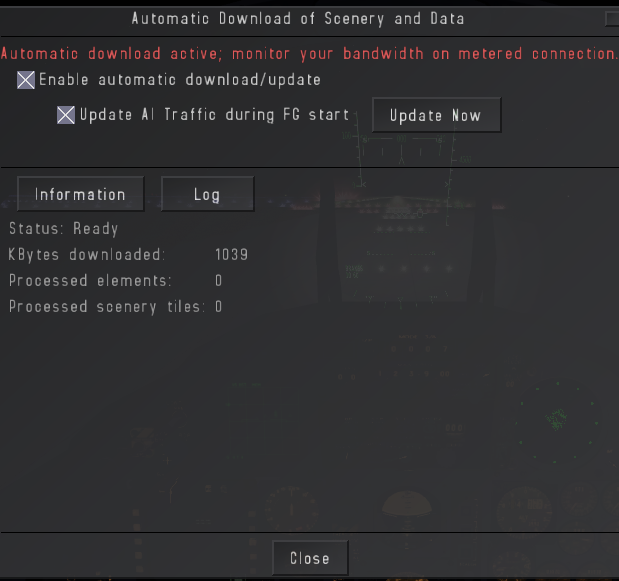 The submenu options under "Download Scenery" propose alot of other things that have nothing to do with "Download Scenery", these "other things" are in this post hereinafter referred to as " BS" . 1. Remove all the BS from the submenus. 2. Change the top level menu title to " Download Scenery and some other BS". Thank you Legoboy for your constructive, helpful suggestion, and I hope you will receive my response in the same spirit as when you offered your suggestion. Basically, the only acceptable solution to the problem (If there does in fact exist a problem), is to change the top level menu option to " Turn on Terrasync" and to remove any of the BS submenu options. Sincerely, and with all due respect to those who tried to do a good thing, but ended up cramming too many ideas into a single implementation, and to make matters worse, used ambiguous language in that effort, and then published it in an official FG release! Last edited by FlyingHigh on Sat Apr 06, 2019 12:07 am, edited 1 time in total. I would have thought that "data" would include traffic files and other data... but ok? legoboyvdlp wrote in Fri Apr 05, 2019 9:11 pm: I would have thought that "data" would include traffic files and other data... but ok? Well that's ok Legoboy, that you "would have thought that" this or that .... but what about the rest of us? You've been around here a long time, and you are a developper. When is the last time you put yourself into the shoes of a first-time user who downloads Flightgear for the first time and who ends up looking at the menu option "File/Scenery Download" and is confronted with trying to figure out what it means?? wlbragg wrote in Thu Apr 04, 2019 9:05 pm: John, I am impressed. I am actually happy you brought this up and it is going to receive some attention, in spite of your approach. @wkitty42 is right though, you would be better off if you think carefully about your chosen words and approach when wanting to make something better. After being around the project longer you realize why some of the "fine tuning" is put on the back burner. It's all volunteer. But it is good that long time contributers that are capable and willing actually listen to new voices as they do have a very fresh view of things. Things that we who have been around awhile either forget about or start to see in a very different light. I'm glad this small improvement is going to be made, thank you John and thank you Richard! Wlbragg thank you and then please consider that I've been watching FG for a long time and sometimes the most basic problems get overlooked release after release. In your post, you reference Wkitty's comments: so , about that , you are correct and Wkitty is correct, perhaps, I should temper my language. But I don't want to see FG get left behind " in the dust" . So, in response to your suggestion, I can tell you that from this point forward, I will try to temper my language in my posts, I will try to express myself in a more effeminate manner in order to not offend the sensitive ones. And your "Dito" should be "Ditto" . It would appear you're right - the standard English spelling is indeed with the double t, but German (and Dutch) spelling with a single t, despite the same etymology from Italian. In actual usage, it does seems to change in English as well though - a quick google comparison test between the terms gives a huge margin of 124 million to 30 million hits for the single t variant (which, as always, may be influenced by more foreign terms intruding, but usually is moderately indicative). Dear Thorsten, I think , once again , you are technically correct. I've read so many of your posts in the forums and I can hardly remember any instance where I could disagree with your point of view in those posts. I love the Germans and the Dutch, but, If I am correct, this forum lives and moves in Standard English. And in British English, Austrailain/New Zealand English, and North American English, we just say " ditto", with the double "tt". But about your statistical analysis of the single "t" versus the double " tt" , I do not doubt you. 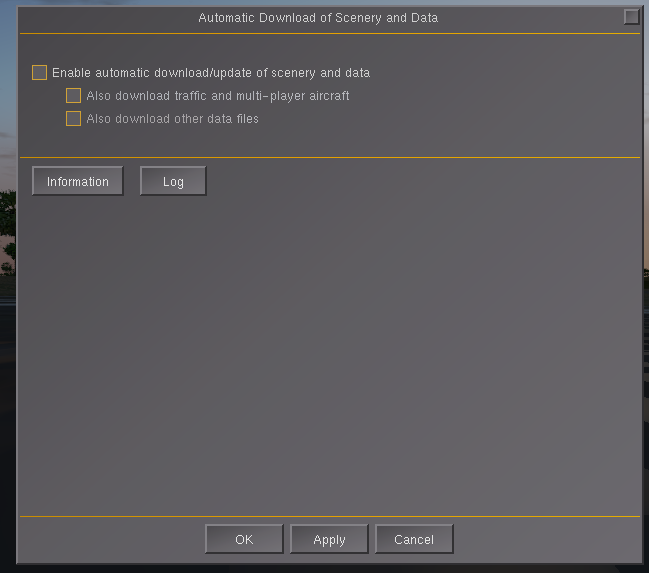 Now, back to this "File/Scenery Download" menu option, it's such a great idea to be able to turn on Terrasync in runtime and to then turn off Terrasync in runtime, but it just needs a bit of refinement so that the first-time user of Flightgear will not become confused in the submenus because of the intricacies contained within the submenus of the option itself. I believe that my participation in this thread (even though I started the thread) has reached the end of it's useful life. Thank you to each member of the community who listened and also to those who responded. I apologize to each member of the community who felt that my choice of language or style was either too aggressive or too disprespectul; it was not my intention to present my ideas like that. And the point of why I started this thread in the first place, that point has been well taken. So therefore, it's time for me to bring closure to my participation in this thread. I won't be participating in this thread any further. If I ever want to address this issue again in the future, I will open a new thread. I've now committed fixes to those items relating to automatic scenery download (Terrasync) and the GUI dialog; available on next or in the next nightly. The enable checkbox now takes effect immediately; however the other checkbox is only used during a restart. Checkboxes and buttons will be disabled when the facility isn't running (AI Traffic, Terrasync). The AI traffic sync will download the folder AI/Traffic from Terrasync; however this folder isn't on the Terrasync servers at the moment (but it might be in the future, so it is still valid to keep this). The dialog itself was part of the problem as previously it had some bugs in it that stopped it from working effectively.